Here’s one of my favorite Amazon 5 star reviews and Linda perfectly describes why going the natural route with flea and tick control can work! I LOVE this product! I have a 2-year old cockapoo and live in a highly tick populated area with many deer that pass through our lawn daily. Not so much fleas around in my experience, but ticks definitely. In 2 years my dog has only had 2 ticks crawling on her (and that was early last year). She has NEVER had a bite! This is my protocol...everyday she gets Agatha's Natural Flea Remedy and she wears a Dr. Mercola herbal flea and tick collar. That's it! I don't give her the tick vaccine and she doesn't get any poison tick ointment on her skin - ever. All my dogs in the past had vaccines and poison and all had Lyme disease anyway. Not this dog! I highly recommend this protocol. It takes several weeks for the powder to get in the dog's system, so you have to give it time. All the best with it. Linda H.
Give this completely safe organic flea and tick repellant a try for your sake and your dog too! Start YESTERDAY using this nourishing little gem of a product. Natural Flea Remedy is not the total answer to keeping your pet flea-free if you already have an infestation, but if you follow the protocol in the eBook included, you can wean your dog off of toxic monthly drops and chewables. You will have to start with this as a natural internal repellant that gradually builds until fleas and ticks can’t stand to be near (or on!) your pet. It’s slow and takes about 30 to 60 days to see best results. I’ve written an eBook (included free with your purchase) but essentially I direct you to add other external controls in addition to using Natural Flea Remedy. Controls like natural spray for your house, yard and pet. There are some amazing products out there (www.wondercide.com) is a good place to start, tell them Agatha sent you! Yes, it takes several steps, but going green with flea control may give your pet a longer healthier life, and you and your family one too! So worth it!!! Kick the toxic flea control habit today! Natural Flea Remedy is the first step to making those alarming monthly flea products a thing of the past. A tasteless - odorless (to people) blend of low-dose garlic, brewers yeast, pest-busting diatomaceous earth, nucleotides and other flea fighting nutrients that you feed your dog daily to make her naturally unattractive to fleas and their evil cohorts ticks and mosquitoes! The truth? No ONE product can overcome a full-blown flea infestation. Other products can claim what they want, but it’s simply going to take time. Start giving your pet Natural Flea Remedy 30 to 60 days before flea season arrive to make your dog a walking natural flea repellent. Treat your dog and your dog’s environment with one of the vast array of SAFE & EFFECTIVE products that will allow you to keep your pet free of pests, (without poisoning your family). If you are committed to finding safe ways to keep fleas off your dog there is a better way. It doesn’t involve cancer causing nuclear flea control weapons. It’s safe and effective and your pets will thank you for helping them AND the rest of the family, stay healthy. Give one scoop daily for dogs under 50 pounds. Over 50 pounds give 2 scoops daily (1/4 teaspoon scoop included in bag). For sensitive pets, start with 1/2 serving daily for 1 week, then increase to full serving. If you’re not, maybe it’s time you were. Page after page on Google shares dire warnings about the level of toxins contained in popular flea drops, chewables, and collars. Here’s a quote from a veterinarian about the dangers of the very products that literally millions of unsuspecting owners are using on their pets. Toxic flea & tick control hurts pets AND the people who live with them and it’s time we did something healthier for our pets and our families too. 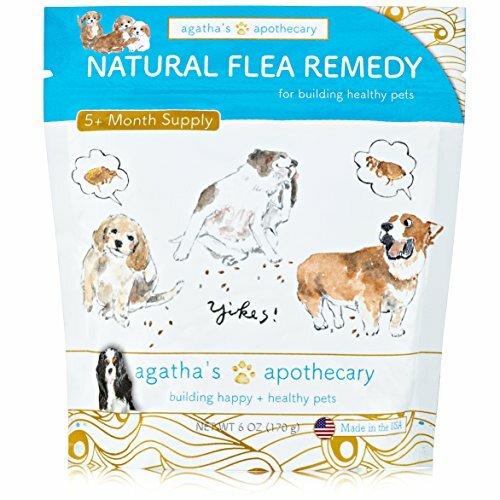 How does Natural Flea Remedy work? Natural Flea Remedy, given daily, works by gradually making your dog smell bad to fleas. (Don’t worry, it’s totally not noticeable to people, only insects will be repelled. Simple, old-fashioned and super effective - it’s not a miracle overnight fix. As much as I’d love you to try this completely safe option to control fleas, if you’ve got a flea infestation already, if your dog is a walking flea magnet, this product alone won’t be enough to overcome that kind of flea problem until your pet has taken it daily for 30 - 60 days. If you live in the middle of flea heaven, you’ll have to address your house and yard too. I’d rather be totally honest up front than disappoint customers and place unfair blame on a great little product by not sharing the downside (and EVERY product has one). Address fleas in the environment (house & yard) with pet & people friendly products. Safely get rid of the fleas on your dog. Use Natural Flea Remedy to make your dog the least attractive canine on your block (as far as fleas and ticks are concerned anyway). Long lasting and economical, each pouch contains 175 servings. A tiny scoop of this ordinary looking white powder packs a whole cornucopia of canine health boosting ingredients fleas & ticks detest. Garlic (do your research, garlic has gotten a bad rap for years but is actually very safe & beneficial in low doses, and more good news, fleas are repelled naturally (you won’t notice any smell but fleas will flee! Food grade Diatomaceous Earth gently cleanses the body of parasites including yucky tapeworms (from fleas) and other nasty internal parasites. Organic Above Sea Coral Calcium - 74 trace-minerals - Most pets are mineral deficient which leads to a host of health problems including Cushing’s Disease. Each batch is laboratory-tested and assayed to ensure quality and guaranteed minerals. Chemical analysis shows that it naturally mimics the mineral concentration of the body and provides significant health benefits. Coral calcium raises the protective alkaline levels (pH) within the body, so your horse has more life-giving oxygen being supplied to every cell to help fight premature cell aging and unfriendly invaders. Coral calcium is a whole food that's not only vital for strong bones and teeth but for the cardiovascular and nerve systems, as well.Rich in minerals - Harvested from the only above sea level source in the world. Pet owners realize, even the toxic products are not foolproof. I had a call from a client the other day who said she was totally disgusted because her dog had fleas even after being treated with a popular monthly flea preventative. Unfortunately, you can use those chemical concoctions and still have fleas and ticks on your dog, and have exposed your the whole family to a product that could potentially harm your pet and everyone who is “exposed” to her! The good news? In recent years, natural solutions for pest control have become much more effective in keeping pets flea-free. Smart pet owners realize that by combining natural flea solutions, they can help their dogs stay healthy and free of fleas and ticks.